PHPKB is a knowledge base software that helps your company to share information with your customers or employees on company public website or Intranet with a professional-grade searchable, customizable and brand-able knowledge base platform, substantially reducing the number of customer support inquiries, improving staff productivity and dramatically reducing time your staff or customers spend now searching for information across multiple systems such as poorly organized websites, shared folders and paper documents. PHPKB is a web-based knowledge base software that can be pretty much anything you want it to be. Use it to share knowledge with others. Publish and manage articles, white papers, user manuals, business processes, FAQs, online help, APIs and any other type of information. All your users would need to access your information is a standard web browser and an internet connection. What makes it the best knowledge base software? The reason PHPKB is the best Knowledge Base Software is that it really has an incredibly fast & accurate full-text search engine, it is very well organized and visually attractive, it is flexible, scalable, fully responsive and it is very easy to use. It has everything that you can ask for in a professional knowledge management software. PHPKB knowledge base software is renowned for its straightforward approach and intuitive self-service tools that encourage your customers to help themselves. It helps you by providing your customers with quicker answers while lowering your team's workload and costs by building a knowledge base system. 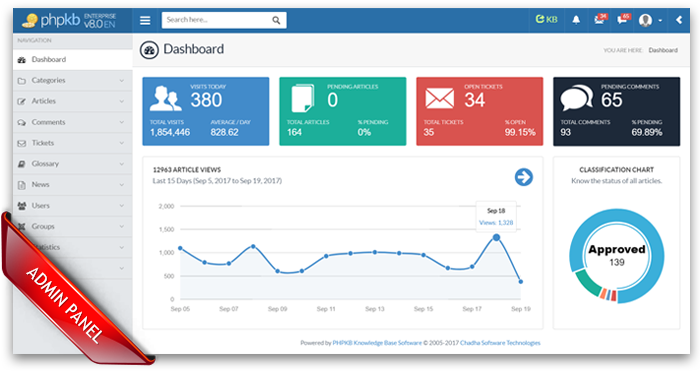 PHPKB knowledge base software has been designed to provide a complete web-based knowledge management solution for your business, both as an online knowledge base system and as an Intranet knowledge base for use by internal staff members. We are sure that you will find everything you expect from this knowledge management software. Our knowledge base software includes all the features & tools you need to set up an intuitive and useful knowledge base. Enterprise class features with the pricing that can fit a small business budget. Managing a comprehensive knowledge base has never been easier. 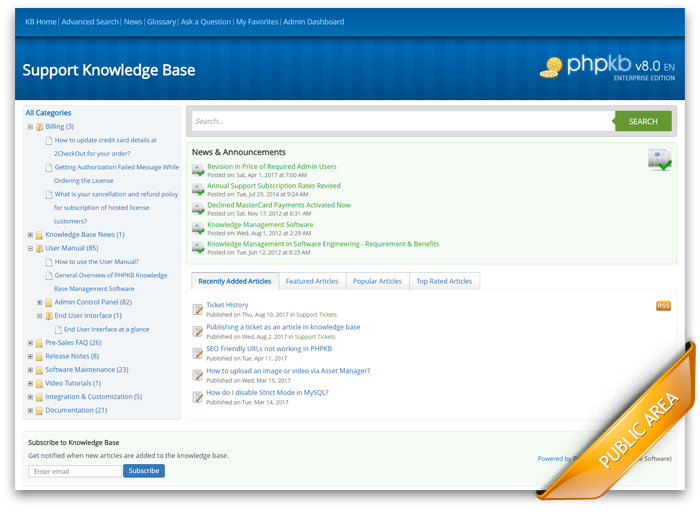 PHPKB knowledge base software comes in 6 editions listed below. PHPKB is provided in two forms: owned (local) or hosted (managed) installation. Owned version allows you to download and install the software on your own server, while hosted version (SaaS) is installed on our server and we deal with the set up and maintenance of your knowledge base on our server. You can find more information about the fully managed hosted version at this link. Giving an accurate and professional answer could be as simple as redirecting your customers to one of the knowledge base articles. Customer satisfaction is improved and customer support workload is reduced. PHPKB knowledge base software helps you share documentation and procedures internally and familiarize your new staff members with product details so that they can be up and running more quickly. 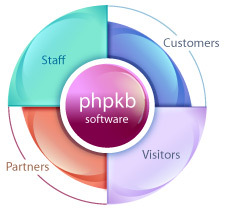 PHPKB knowledge base software is the most user-friendly self-help system available in the market today. You are most welcome to compare other KB applications with PHPKB and see the difference. You'd find that PHPKB is the most feature-rich and user-friendly knowledge base software that you can buy. You can fully customize the header and footer of your knowledge base to make it fit with your website style. It is very easy to change the look and feel of PHPKB knowledge base software according to your website's color scheme & layout. Our knowledge base software comes with full source code. The source code is not encoded/encrypted, which means you can change the files according to your needs. You are free to modify the source code to suit your requirements. You are free to remove our logo and use your own logo. Articles are categorized in your knowledge base. All visited pages of your knowledge base, from the home page to the currently viewed page, are recorded. This makes it easy for your visitors to find answers and backwards navigation. An example for the breadcrumb is shown below. It is easy for your visitors to search for what they need in your knowledge base. Both quick search and advanced search are supported. The search result is displayed according to their relevance for the search keywords i.e. most relevant results are display on top. Featured articles are similar to 'sticky threads on forums' in a sense that they are listed above normal articles, so that your visitors can easily notice them. No matter if you are browsing the categories or viewing the search results, featured articles would always be on top of non-featured articles. A list of related articles is displayed with every article, that helps your visitors get more related information from your knowledge base. The feedback features in PHPKB knowledge base software allow the users to rate an article as helpful or not helpful and leave a comment to an article. This helps you understand the needs of your visitors, improve the quality of the articles and optimize your products and services. PHPKB knowledge base software is compatible with all major web browsers, including Google Chrome, Internet Explorer, Firefox, Safari and Opera, on all major platforms, including Windows, Mac and Linux. Your content can be used externally for customers but also internally for your customer support team. use it as a powerful tool to create an online documentation system for your entire company. We keep our knowledge base software and services up-to-date with most recent technology and updates available. Don't take our word for it, sign up for a fully-functional free trial of our knowledge management software and experience a smarter way to manage knowledge.